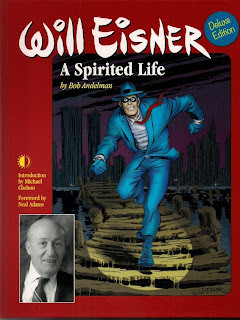 Order ‘Will Eisner: A Spirited Life’ by Bob Andelman, available from Amazon.com by clicking on the book cover above! The true Golden Age of Comics is right now. It’s a time when fans can read many of the great and not-so-great comic books of decades past in print or electronic form. It’s a time when great new comic books and graphic novels are being created in every genre you can imagine and from all around the world. It’s a time when dedicated comics historians are working tirelessly to discover and preserve the history of the art form and its creators. TwoMorrows Publishing of Raleigh, North Carolina is a treasure in this most golden of comics ages. The company publishes some of the best magazines of comics history – Alter Ego, Back Issue, The Jack Kirby Collector – and the informative Draw! (The Professional “How-To” Magazine on Comics, Cartooning and Animation). The publisher’s catalog include books on comics history and comics creators. In a competitive field, TwoMorrows more than holds its own with all of the other publishers doing such great work in this area. Order ‘1000 Comic Books You Must Read’ by Tony Isabella, available from Amazon.com by clicking on the book cover above!